Notes: Associated with book ID 589. CARTOGRAPHICUS; This is a fine example of the 1877 Stanford Map of Mount Cameroons and vicinity, West Africa. Centered over Mount Cameroon, the map covers from Rio del Rey to the Fernando Po (Bioko) Island. Based on the Drawing of Rev. T. J. Comber, a Baptist missionary to Cameroon, who later explored the various rivers of the Congo Basin, the map identifies various springs, rivers, lakes, peaks, hills, villages and various other topographical details. One of the largest and active volcanoes of Africa, Mount Cameroon rises to 13,255 ft. Various routes to ascend the Mr. Cameroon and several Baptist Missionary Society stations are noted. Relief is shown by hachure. This map was drawn by A. K. Johnston and published by e. Stanford with contributions by W. J. Turner, as part of the Proceedings of the Royal Geographical Society and Monthly Record of Geography, Vol. I, in 1879. Date: 1877 (dated) Source: Stanford, E. Proceedings of the Royal Geographical Society and Monthly Record of Geography, Vol. 1, 1879. Cartographer: Alexander Keith Johnston (28 December 1804 - 9 July 1871) was a Scottish cartographer and map publisher active in the middle portion of the 19th century. Johnson was born at Kirkhill, near Edinburgh, Scotland. He studied at the University of Edinburgh where he apprenticed as an engraver. Around 1826, in partnership with his brother William, Johnston he founded a cartographic printing and engraving firm with the imprint "W. and A. K. Johnston". Johnston made a name for himself in educational geography, publishing numerous maps for use in schools. His brother, William Johnston, eventually left the firm to pursue a career in politics, eventually becoming the Lord Provost of Edinburgh. 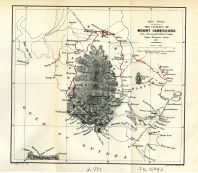 Alexander's son, who would bear the same name, became a geographer and explorer, suffering an untimely death on the Royal Geographical Society's 1879 expedition to Lake Nyasa. Cartographer: Edward Stanford was one of the most prolific map publishing firms of the late 19th century. The company began as a partnership in 1848 between the 21 year old Edward Stanford and the established map dealer Trelawney Saunders. By 1853 the partnership had dissolved and Edward Stanford took full control of the business. In 1882 Edward Stanford Sr. passed the firm on to his son, Edward Stanford Jr. who continued in his father's proud tradition. Today the Stanford firm still publishes maps and remains one of the most important and prolific cartographic publishers in the world. .